We are very excited to take a new little baby step in our crafting journey by letting some amazing craft buddies to join hands with us and help us keep inspiring other to let the crafty mojo alive and inspired. Just looking for enthusiast crafters who just loves to craft and inspire others. # Really committed, creative and enthusiastic to crafting some amazing inspirations. # Will be joining in hands for 6 months tenure i.e. September-2018 to February-2018. Can be extended as per choice. # Some nice photography skills, video making will be an add-on benefit. # Encourage and promote all the entries on the blog as well as our blog challenges and promotions via social media, help us reach more creative people around us. # Complete the required projects before deadlines, a little prompt on revert and updates. # Prior notice ( a month) just incase you wish to leave so that we get enough time to get another member join us. # A Crafty Designer Member batch to flaunt on your blog. # We will work hand in and to grow together and promote your work as well as blog/social media. # Your awesome picture and details on our blog. # Pack of newly curated products in our studio or sponsored products to design. # Added benefits to plan workshops at our creative space and much more. # Highly motivating and inspired team to work with and grow together. 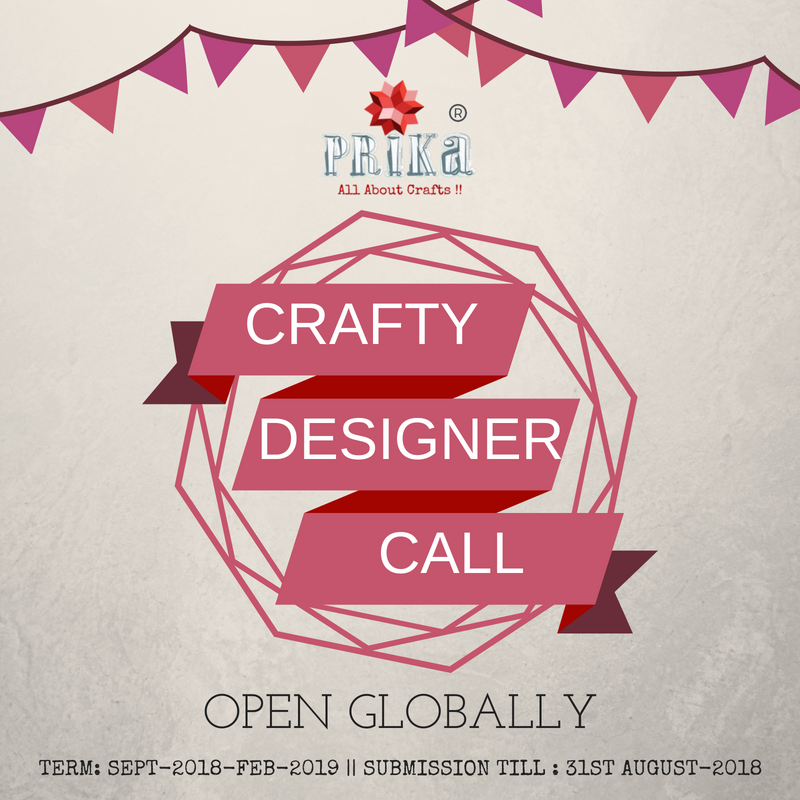 # Subject Line: Prika Crafty Designer Call-2018- "Your Name"
# Share your Blog and Social Media handles Link. # Some details about yourself, crafting journey...teams worked with and any specialised crafting like card making, scrapbooking, mixed media, Flower making etc. Quickly enrol yourself to be the part of our team...last date to apply is 31st of August-2018. In case of any queries feel free to connect in below comments, via email or any of our social media pages. Looking forward for your lovely entries soon. hey is it necessary for te blog to be updated?